All the greatness you expect from Palazzo, but a one bedroom, two bathroom alternative. Located on the sixth floor, this might be worth a look even for parties needing more sleeping space than one bedroom, as it sleeps 4. At the Shores of Panama, where emerald waters shimmer alongside dazzling white sand beaches, time is forgotten. While drinking in the spectacular beauty of the Gulf of Mexico, family and friends gather poolside, picnic on the beach, dive into the pleasures of the water, and unwind without a care. With 23 stories of new, luxury, gulf-front condominiums, the Shores of Panama—in Panama City Beach, Florida—rises above and beyond as the ultimate beach destination with amenities that capture the spirit of the Emerald Coast. You deserve a memorable beach escape, and the Shores of Panama grants Florida vacation getaways that delight and surpass expectations. Emerald Isle Resort stands 23 stories tall with 199 fully furnished two bedroom/two bath units all with vast private balconies overlooking the Gulf of Mexico. This luxury condominium sits on the west end of Panama City Beach, providing peace of mind both in location and value. You'll find yourself away from the noise, but just moments away from the excitement and attractions along Panama City Beach. Welcome to Splash! With something for each and every member of the family, this resort is a vacation unto itself. Kids will enjoy pool parks with water slides, spray toys and other interactive water toys, a lazy river ride, a “dive-in” movie theater, and a kid’s entertainment/arcade room. Mom and Dad can escape to the fitness center, the Jacuzzi, the beachside bar & grill, or to the beachside activity lawn. Of course, directly outside your door are the pristine, emerald waters of the Gulf of Mexico. 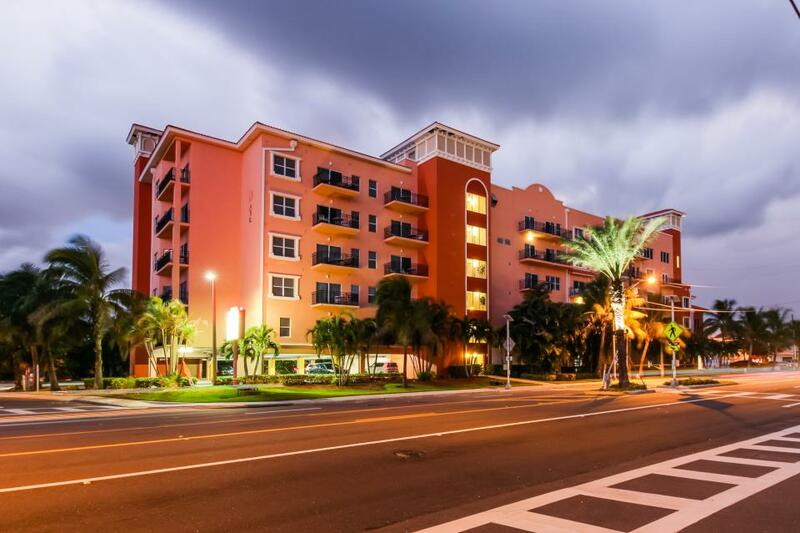 Also just a leisurely stroll away is Pier Park, a 1,000,000 square foot complex encompassing everything from dining and shopping to entertainment--that is, is you can force yourself to leave this gorgeous 2 bedroom/2 bath unit. Perfect for vacationers looking for many on-site amenities and the quieter side of Panama City Beach, Celadon Beach Resort is located in the perfect place. With most master bedrooms facing the Gulf, custom features of this resort include a breakfast bar, marble baths, and washers & dryer in every unit. 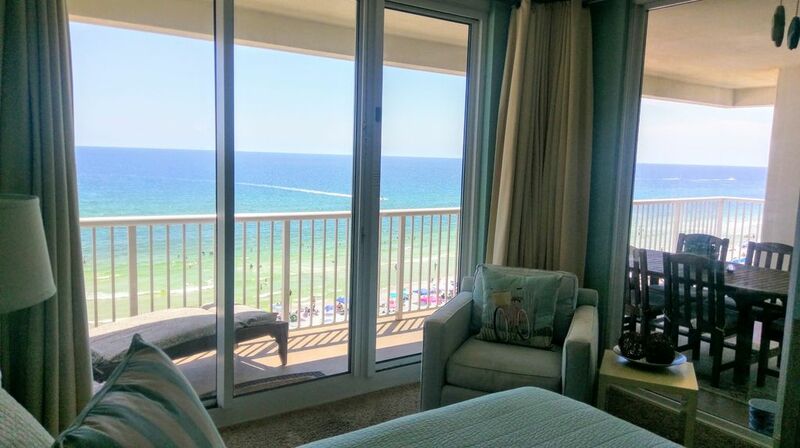 Celadon Beach Resort Condo Rentals is located in West Beach, and approximately 2 miles from Pier Park and the City Pier. Recreational amenities include an outdoor pool, an indoor pool, a children's pool, a spa tub, and a fitness facility. Additional property amenities include guest parking, barbecue grills, an arcade/game room, and umbrellas. Majestic Beach Resort has captured the spirit of life on the beach in a condominium resort with over 650 feet of beachfront, spacious suites, and private balconies. During your stay at Majestic Beach Resort, take advantage of all the activities available on the sugar-white sands of Panama City Beach right outside your door. Dive into the emerald green waters of the Gulf of Mexico, indulge your senses at our health club and spa, or plan activities for the whole family. Whether it’s golf, sunbathing, or fine dining that you’re looking for, you will find it here. 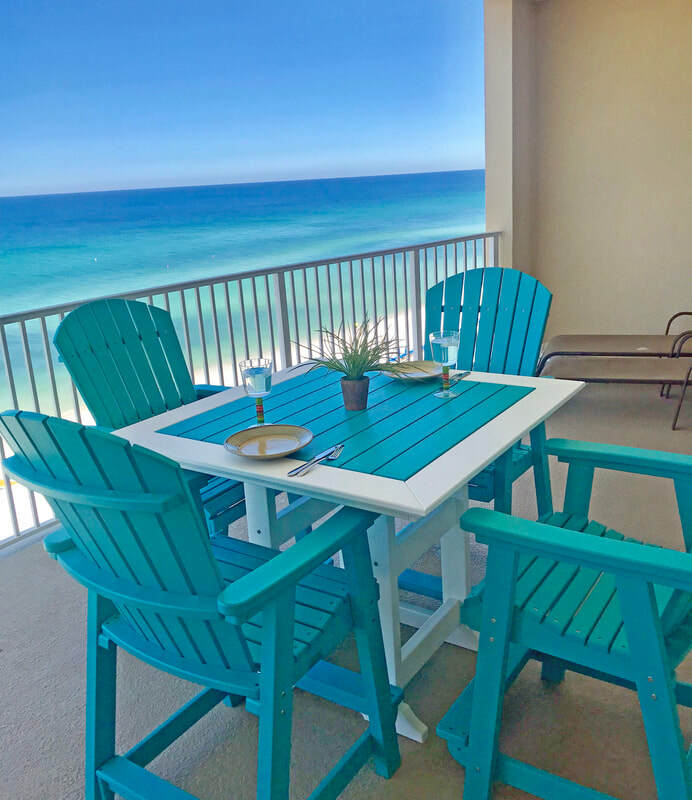 Grand Panama Beach Resort by Emerald View Resorts, one of the most elegant vacation rentals in Panama City Beach is located on the Gulf of Mexico, delighting vacationers of all ages and preferences with a glorious blend of natural beauty and luxury amenities. Over 650 feet of beach on the Gulf of Mexico enhances our gated rental resort community, which features two spa pools, a state-of-the-art fitness center, dining, and a full range of services provided by our staff. Located directly on the Gulf of Mexico, this sophisticated condominium's location is perfect. Delightfully decorated with upscale appointments, each two bedroom/two bath unit features a fully equipped kitchen, king size bed in a master bedroom, washer/dryer and flat screen LCDs. Full-view windows offer gulf view from the living room and master bedroom. Large private balconies in each unit enhance the brilliant beach views. Lush tropical landscaping, private parking, two pools (one indoor, one outdoor), a hot tub, steam room and an exercise room with sauna will make your vacation simply perfect. Here, you will find an amazing intersection of accessibility, value, and quality. With two pools and a location central to most everything, including other nearby towns, you will also find yourself surrounded by things to do. If you are looking to relocate or just want to check out the area, pay us a visit. This beautiful south Florida home overlooks a lake from every main room: living and dining rooms, foyer, and master bedroom. It is furnished, has an in-ground pool and hot tub, and with 3 bedrooms and 2 bathrooms, it's ready for you to get cozy. 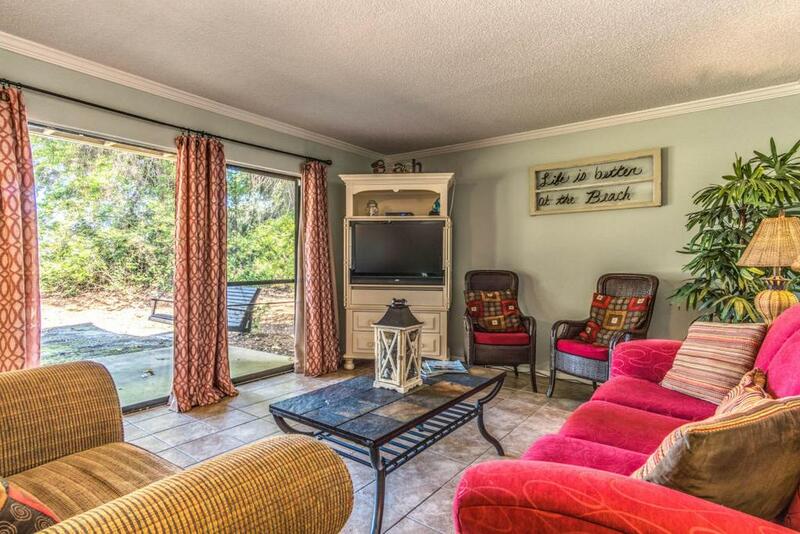 ﻿Step behind the gates of this beautiful escape nestled in Eustis, FL. With a private entrance, two car garage, and pool access, its accommodations are quite robust. Don't let its name fool you. It's a small world unto itself. Here we have a wonderful 3 BR/3 BA home in The Villages. With two golf carts, pools and golf courses both within walking distance, this is the best of both worlds. The home is situated on a spacious corner lot with plenty of room for you to kick back, inside and out. We know you'll think it's got the "WOW" factor; we certainly do. Make this serene Leesburg vacation rental apartment your home-away-from-home during your next Florida vacation! Complete with a private deck, massive swim spa, and sprawling lakefront property, this quaint abode will let you truly live the peaceful lake lifestyle, while still being within close proximity of major Central Florida attractions! This is a gated community with large, open floor plans sporting breathtaking views of the harbor and Gulf of Mexico. The community is adjacent to restaurants, charter boats, and watersports. With weekly, world-famous fireworks shows viewed from the oversized balconies and the ocean just a stone's throw away, you'll be in paradise. Everything you need is just a few short steps away. All units have been professionally decorated. The kitchens are fully equipped with top-of-the-line stainless steel appliances and sparkling granite counter tops. Once you check in, you will never want to leave. ﻿Welcome to your lake paradise! With 4 bedrooms and 3 bathrooms, this gorgeous house on Crystal Lake is sure to accommodate your entire group and still leave plenty of space to get comfortable. And comfortable you will be, viewing some of Florida's most beautiful scenery--at a great value to boot! This home is open for long-term winter rentals (November 1st - March 1st). 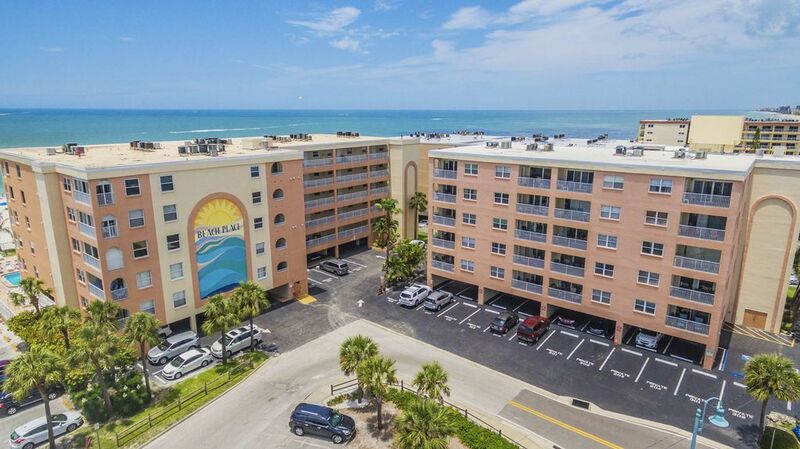 On the waterfront overlooking the Gulf of Mexico, this bright condo resort with Mediterranean-style architecture is a 6-minute walk from the John's Pass Village and Boardwalk, and 5 miles from the Suncoast Seabird Sanctuary. Two separate 2 bedroom/2 bathroom units are available, each on the same floor; each sleeps 6. Beach Place Condominiums is the closest complex to world-famous John's Pass Village and Boardwalk. Other amenities include free WiFi throughout the complex, a beachfront lounge area with tiki huts, a large heated beachside pool, and 3 BBQ grills for cooking your catch! This cozy 2 bedroom/2 bathroom home in St. Petersburg is a perfect match for those looking for short-to-medium term lodging in a clean, modern home. 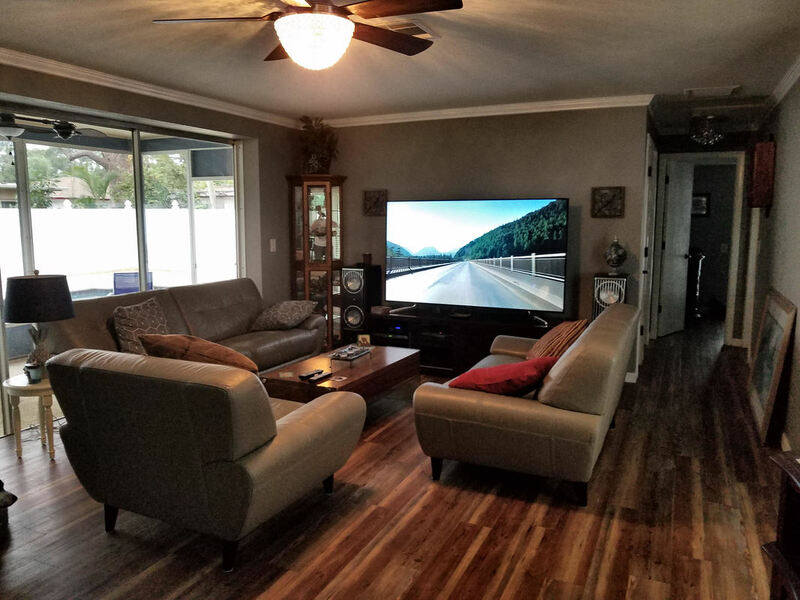 The property is certainly attractive to such a renter, complete with a pool and a private bathroom, and it is conveniently located to downtown St. Petersburg as well as much, much more. Only one bedroom is available. This lovely home is available from May 1st to October 31st. 1,163 sq. ft., furnished except for one bedroom that you could turn into an office or exercise/meditation room. It has a big private fenced in backyard, stainless steel appliances, dishwasher, new central A/C, as well as washer & dryer. Top o' the Gulf, to ya! Built in the early 1900s, we have worked tirelessly to preserve the historical elegance of this property while adding modern relevance and utility. Senators Inn is home to a group of local businesses, from massage therapists of differing styles and focuses to an aesthetician and hair stylist--and even a computer repair specialist. Immediately next door is our own Senators Pub, and should you need to stay the night, there are multiple rooms for rent at any given time--all unusually high quality rooms in a unique, tranquil setting. Visiting Cape Girardeau and looking for a special place or a location for a romantic getaway? Step back in time and stay in the recently renovated Historic Kage School Guest Cottage. Established in 1854 and operated as a public school until 1966. Boasting 2 huge bedrooms and 1.5 baths with 13' ceilings, this unique and historic one-room school house was completely remodeled in 2014 and is richly furnished with art-deco style furnishings and modern appliances. Amenities include fully equipped kitchen, washer & dryer, high speed internet and 50" big screen TV. Incorporated into the renovation were the original pine hardwood floors, original school lighting and many other historic artifacts which are on display inside the cottage. Supersweet vintage-decorated dollhouse cottage with babbling brook, nestled in green rolling hills a half hour from downtown Asheville. Perfect for two, but it can handle a third. Gourmet kitchen, screened porch, propane grill, claw foot tub, fenced yard. This property is like a cozy getaway from all things monotonous. This 2 bedroom/1.5 bath in Historic Miamisburg is a short 12 mile jaunt from lovely Downtown Dayton and a mere 5 miles from I-75, I-675, and I-70, allowing for easy commutes to and from wherever you need to be. Conveniently located to local parks and activities, there will never be a shortage of things to do. Currently available for short-term or long-term rentals. Welcome to the most peaceful stretch of North Myrtle Beach, where you will find complete tranquility paired with priceless views, all while being in close proximity to countless avenues for entertainment. Centrally located and yet far enough from its neighbors that the views of the Atlantic are completely unobstructed, this is the perfect penthouse for those looking to escape the monotony that cramps so much of our lives. At only 28 units, this nine-story property has extremely low density, meaning you will experience unparalleled privacy at the pool, hot tub, grills, picnic tables, and on the beach. While this is not the place for wild parties due to the quiet nature of the property, if you are looking for a place to unwind and get reacquainted with happiness, you have come to the right place. This rare gem is nestled in the Smoky Mountains of Tennessee at the gorgeous RiverStone Resort, less than a mile from Dollywood and just a short drive from the wondrous expanses of the Great Smoky Mountains National Park. At RiverStone, you will enjoy an exhaustive list of amenities second to none in the area, including Gatlinburg Golf Course, a full-service spa, a heated, greenhouse-style indoor pool and hot tub, fitness center, outdoor lazy river, game room, and Little Pigeon River nature trail. The resort is also conveniently located to Pigeon Forge’s top dining and entertainment attractions, Dollywood being only one of the many things to experience during your time here. Overlooking a gorgeous lake as well as its accompanying marina, this picturesque retreat is great for land-dwellers and those wanting to relax on the water. The all pine construction ensures that, even taking the views in from indoors, you'll feel one with nature. For those who wish to venture out from your quarters, Gatlinburg and the Great Smoky Mountains National Park are both within an hour of this beautiful location. Stay in a beautiful lakeside lodge on Lake Douglas in the middle of the Great Smoky Mountains close to Gatlinburg, Sevierville, Pigeon Forge, and Dolly World! Enjoy 5 bedrooms (3 King & 2 Queen Beds), 2 60" Sony TVs along with Direct TV, plus so much more.